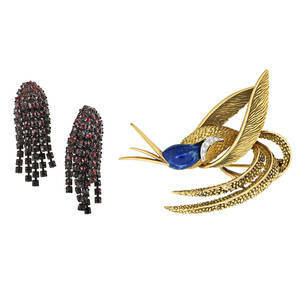 SILVER HUMMINGBIRD BROOCH & GARNET GLASS EARRINGS; French 850 silver gilt hummingbird brooch with lapis and six single cut diamonds, approx. .06 ct. TW, ca. 1980, marked Made in France, 2 1/2"; Pair of Marvella black patinated and "garnet glass" fringe earrings, clip backs, ca. 1960, 2 1/8". Silver 17.5 gs.